You can use data in JSON to duplicate charts first created as a template and supply a new datasheet for them. You can control the order in which specific templates are used to construct a new presentation. Templates can also be used multiple times. Both the PowerPoint templates and the JSON data can be stored either locally or remotely. The JSON data may even be generated on the fly by a web service. An example of JSON data for think-cell is shown below and can be found in the file sample.ppttc in the subfolder ppttc of the think-cell installation directory. The JSON specifies a presentation to be created from a concatenation of templates. It conforms to the schema at ppttc/ppttc-schema.json. At the root level is an array of items. Each item specifies a template file and data for its charts. Different templates can be concatenated and a single template can be used more than once. In the simplest case, a single template is used a single time to fill all charts contained in that template with data. Each item in the array of concatenated templates contains two keys: template and data. The value for template is the path to a PowerPoint file with think-cell charts for which a name has been set as an identifier (see Introduction to automation). The template file can also be retrieved from a remote location as described in Providing the template remotely. The value for the key data is a list of data tables in JSON format for the charts contained in the template. Each item in the list has two properties: name and table. name specifies a chart using its name and table holds the data table. A row with an empty cell first (null) and then cells with category names. A row of 100%= values. If no 100%= values are used, the empty row is specified as . Multiple rows with a first cell giving the series name and subsequent cells containing numerical values. 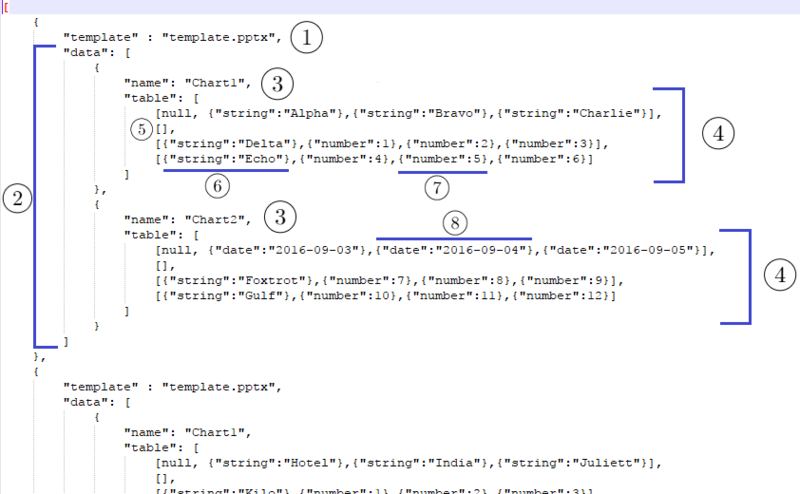 Any chart that can be given a name can be referenced in JSON. For their specific datasheet layout, see their respective chapter or simply open the chart’s internal datasheet for reference. Note: Any cell within the think-cell datasheet range can hold any kind of text. If desired, the first cell in the first row can also be filled. Any formatting of the contents of the cells (e.g., specifying the date format) has to be done in the PowerPoint template. think-cell reads the file and checks its structural integrity. A new presentation is created. For each item at the top level of the JSON file, the new presentation contains a copy of the specified template. In the template copies, the datasheets of the charts identified by the name values are replaced with the data in the table values. Any total labels, label placements and difference arrow values or other chart decorations are updated. Afterwards, the new presentation is displayed. The user can further edit its contents and save it or use it in any other way. The JSON data in a .ppttc file can also be generated remotely by a web service and offered to the user for download in a web browser. Please see the sample provided below and in sample.html in the subfolder ppttc of the think-cell installation directory. In our example, the JSON data is compiled on the fly when the user requests a download. While the example embeds static data, you may of course dynamically create JSON from other data sources using parameters given by the user on your website. When a .ppttc file is downloaded, the user can choose to save the file or open it similarly to other downloads. When opening the file, the JSON data is used to create a new presentation as described in Using the JSON data to create a presentation. Template files with think-cell charts can also be provided via a remote server. In this case, the value for the key template is a URL instead of a local path, as shown in the remote JSON example above. 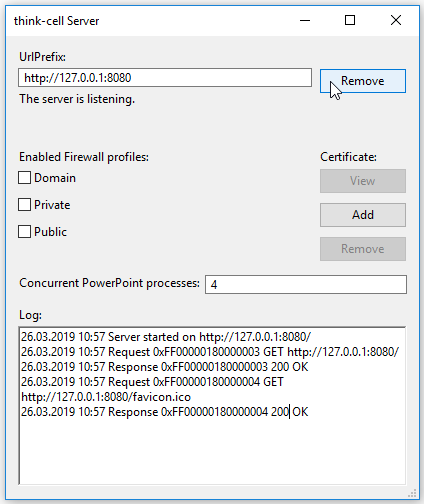 The URL can specify http as the protocol, https for a secure connection or any other protocol valid on the system where the .ppttc file is opened. When processing a .ppttc file that refers to a remote template, PowerPoint retrieves the template file. Therefore, the user that opened the .ppttc file needs appropriate access to the remote template. When the JSON data is generated remotely by a web service and the templates are also stored remotely, only a standard think-cell installation is necessary on the users machine to use dynamically generated PowerPoint presentations with think-cell charts. You can run think-cell’s processing of JSON data as a server. The merging of JSON data with templates to create PowerPoint presentations is done on a remote server in that case. The server accepts JSON fragments as input and delivers the merged PowerPoint presentations as output, both via HTTP. Specify the IP address and port the server should listen at in the UrlPrefix field in the form of a URL. The first part of the URL determines whether unencrypted HTTP or encrypted HTTPS is used. 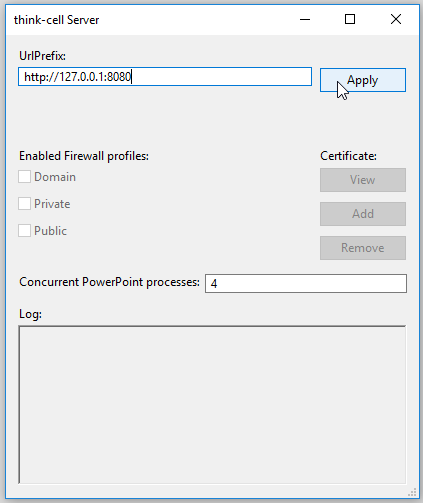 Confirm the configuration changes of your system in the User Account Control (UAC) dialog that appears. In the Log field at the bottom of the window you will see a confirmation that the server has started and is now listening at a URL. You will also see all client requests and server responses in the Log field. To stop the server, click the Remove button. To change the URL, enter a new URL in the UrlPrefix field and click Apply. The server accepts JSON data as HTTP POST requests with MIME type application/vnd.think-cell.ppttc+json and responds with a PowerPoint file. HTML markup for a button that invokes a method using XMLHttpRequest to communicate with the server when clicked. A static JSON fragment. In your use, you will typically generate the JSON data dynamically.